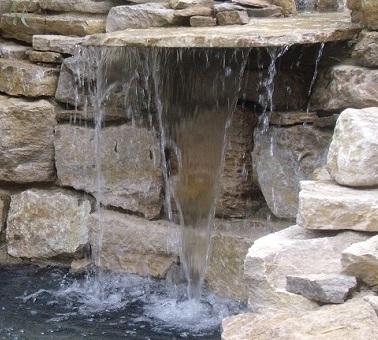 Without a doubt the most popular and versatile natural water feature is the stone waterfall or cascade. If built correctly a waterfall will add to the aesthetic quality of a garden design. A waterfall doesn’t only look good, it also helps to oxygenate water and provides a convenient way to return filtered water back into a pond. Stone waterfalls can be built on level or slopping ground and use a large variety of landscaping stone or rock boulders. We can even build you a fully remote control waterfall. 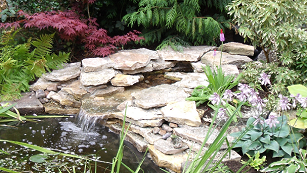 Another often overlooked positive aspect of adding a waterfall as a water garden pond feature is its ability to cancel out noise pollution and replace it with the soothing sounds of cascading water. Noise pollution cancellation with a water feature can be a major advantage for people living in cities or built up areas. Water features London in particular use this method to improve a gardens acoustic ambiance. Water Scenes design and build our own natural rock waterfalls to a very high standard. We have built bespoke custom waterfalls for Koi fish ponds, water gardens and as stand alone features. We know that waterfall construction is a very difficult skill, some say acquired art and go to great lengths to produce quality stone water features. Building a successful waterfall involves hard work and requires finding a good balance between the functionality and overall look. It’s very easy to build a waterfall that looks great but leaks or on the flip side, a waterfall that never leaks but looks awful. Water Scenes design our garden waterfalls to do two things, look natural without the loss of water. The key ingredient, rock can be sourced from a wide range areas. Using local rock will further help increase the natural look. Our waterfall rock comes from sustainable sources and can be individually selected to further improve our bespoke hand built waterfalls. Our natural stone water features can be built as indoor water features or outdoor water features with or without a visible pool. A Water Scenes natural rock water feature or garden pond design will usually consist of two key components. 1) The pool for fish and or plants. 2) A feature such as a waterfall or cascade. Waterfall feature without a pond. As we mentioned above our natural features usually require a pool for plants or fish but can also be made to be a pond less water feature. A waterfall feature that has no pool or pond is particularly useful if you have to consider child safety or health and safety in general. The risk of drowning can be significantly reduced when water does not collect in a pool or pond. For more information call 0800 0232 988 or email us via our contact page. Rock water gardens are a popular option for fish keeping and water feature enthusiasts, they can be incorporated into almost any shape, size or style of garden. Waterfalls have a natural look that works successfully to blend in with most planting styles and can really help to provide contrast to a garden design. It can be difficult for a client to visualise a 2D designed waterfall on paper so we offer a 3D design service that will really help you to understand how your waterfall or feature will look. 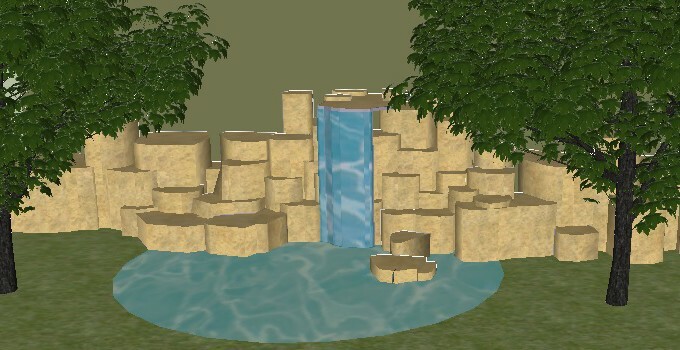 3D Pond design with waterfall. Water Scenes are a specialist water feature company with more than 15 years experience in pond, water feature design and construction. We have been commissioned to build 100s of natural stone garden waterfalls. If you have a project where you feel it would make sense to use a professional water feature company why not contact us. Our feature projects can be independently insured and our work is covered by a two year guarantee. Call 0800 0232 988 For more info on our bespoke water features.